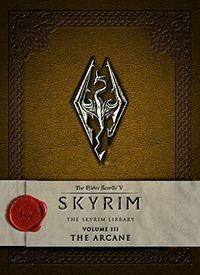 The Elder Scrolls V: Skyrim - The Skyrim Library, Vol. 3: The Arcane is the third of three volumes in the Elder Scrolls V: Skyrim - The Skyrim Library series, which is a printed version of many lorebooks from the game, paired with concept art. It was released September 13, 2016. This page was last modified on 19 November 2018, at 06:44.